The platoon on my work in progress display board. The plastic grenadiers from Open Fire were quite nice to paint. The detail is pretty good. A few models suffer from their position in the sprues with a few misshapen faces but overall I really like the models. 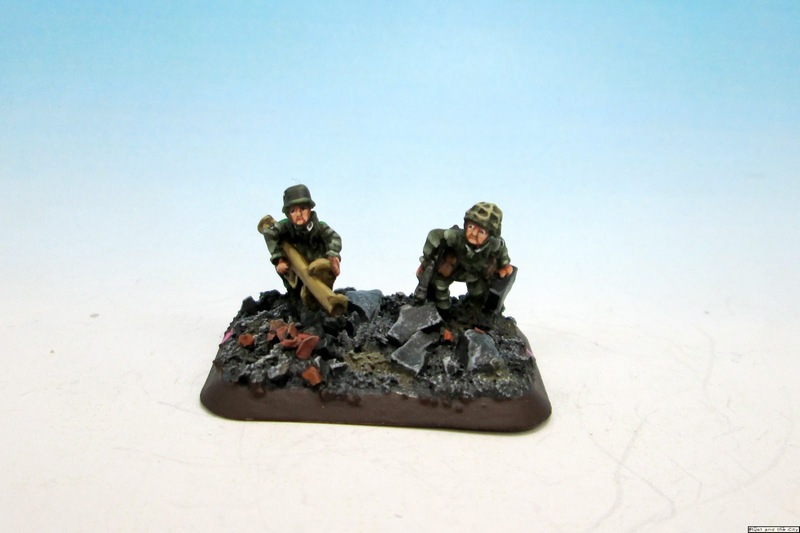 The Tank Hunter team (with a Panzerschreck) is metal and are noticeably slightly smaller and more awkwardly proportioned than the plastic infantry. The half-tracks came in a mystery lot I bought off of Bartertown. Unfortunately they are not Battlefront models (which I did not know when I purchased them...). I don't really like the sculpts as they are a bit small and look silly with crew inside them. I'm planning to paint up a replacement platoon of half-tracks once I finish my other models and decrease the backlog. The 6 month painting challenge is also helping to curtail that. I spent a bit of time researching details to add to the models. 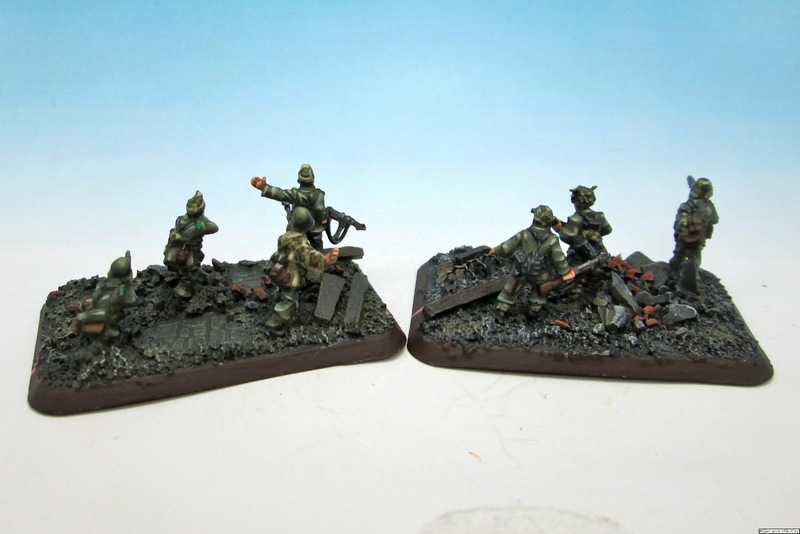 The models have green waffenfarbe for Panzergrenadiers. I decided not to do them specifically as Aufklarungs as I want to use them as Panzergrenadiers in other lists. 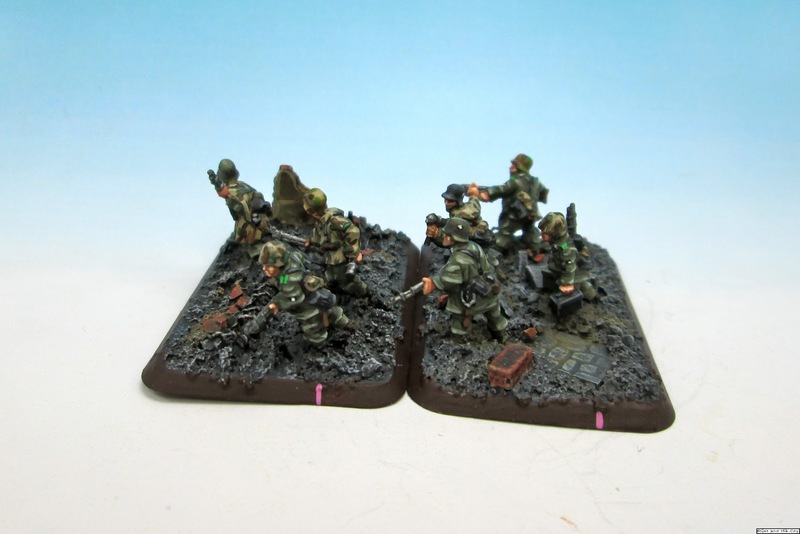 I also used a lighter green for the waffenfarbe so they would contrast with the fieldgrey uniforms. I added rank insignia using the Art of War book from Battlefront and some research online for how many of each rank would be in a squad. I painted helmet decals on some helmets and added extra detail like tank hunter awards to some of the models. The collar tabs were tricky to paint but I added them where collars were visible. I put the pink markings on the sides of the bases to tell platoons apart. I find I can't tell my opponents platoons apart when the markings are on the back of the base. The amount of stuff carried by German infantry makes them exceedingly slow to paint. The bread bag, entrenching tool, gas mask cannister, rifle, ammunition pouches, webbing, pistols, ponchos, helmet covers, sticky bombs, canteens, and other things on each model takes a long time to paint. For some items, I chose alternate colour schemes to contrast more with the fieldgrey uniforms. FOr example, I used the alternate colours for some of the items and the gaiters as listed in the Art of War book. Variations of green everything left the models with no contrast. So much stuff on their backs! 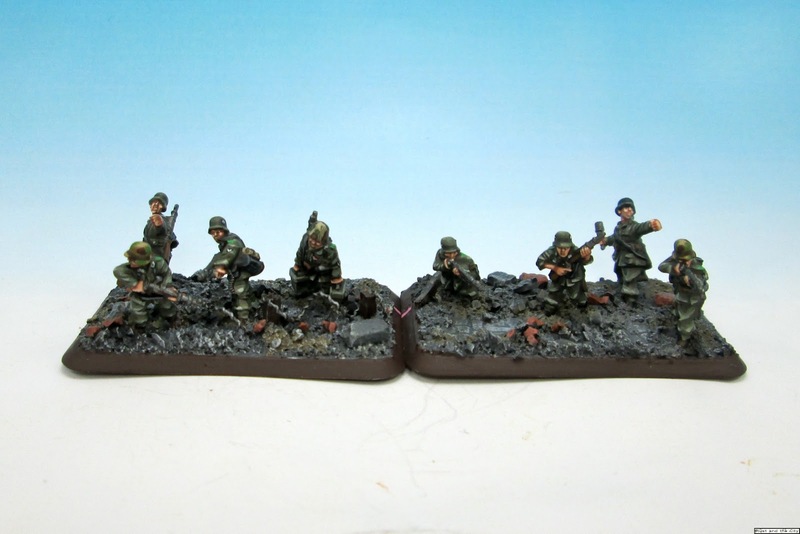 I enjoy painting 1 or 2 stands of infantry but really find a whole platoon a bit of a drag. I would estimate that each base takes me around 3-5 hours in total to paint depending on the time spent on things like basing. With the time invested in painting, I do wish I had spent more time on assembly as I used a platoon that someone else had assembled. 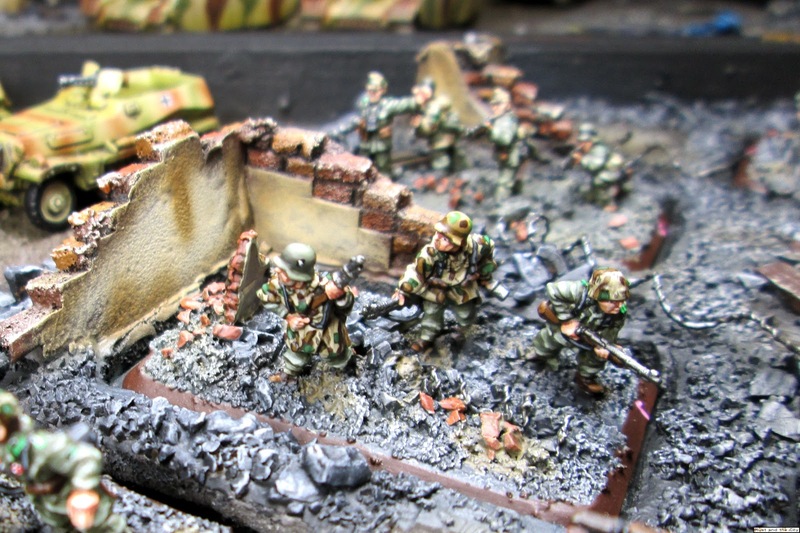 A few rifles and machine guns stick out over the edge of the base (a pain for storage). Some of the combinations of figures on the bases don't totally make sense either. I am extremely pleased to have this platoon finished and behind me. Now I can take my time painting the 24 (!!!) 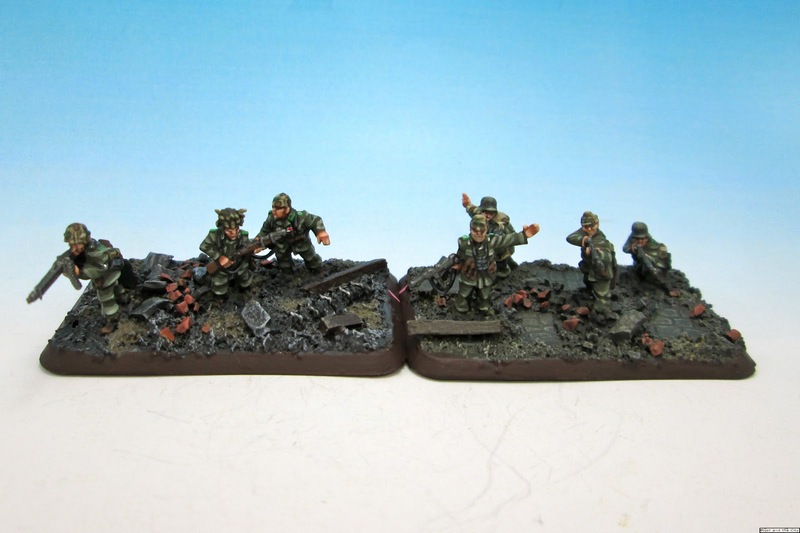 stands of Panzergrenadiers I need for an Atlantik Wall Lehr list. 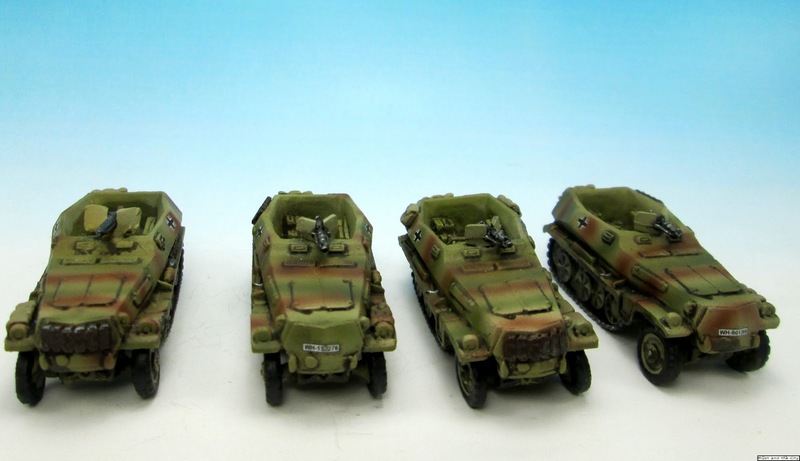 I've finished the Panzer IVs and Pumas for my Attack-X list as well. I just need to complete the Nebelwerfer platoon and then I am totally ready. I am dreading painting more skin tones though... As always, comments and constructive criticism are greatly appreciated! Thanks for visiting! Fabulous, I don't play any WWII games but I love seeing the models painted, they always have so much character crammed into the tiny models. You've done them amazing, I struggle to put eyes on a 28mm model so absolute awe in how you manage this.. The last picture is really dramatic too. Thanks Dave. 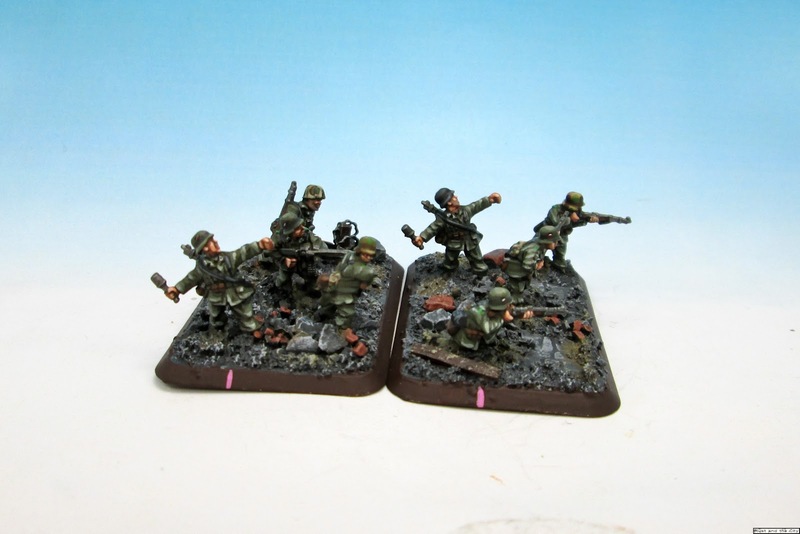 Have you considered Bolt Action (after the challenge!)? The eyes are a little rough on such small figures. They are really no smaller than 28 mm eyes, they are just way out of scale. What you've shown of the display board looks really cool so far - basing on the troops certainly fits in well too. Could be used for West or East Front, right? PzGrens are pretty as ever mate. Your attention to detail is astonishing. Glad you aren't in my area for tournaments - I'd never win a best painted! Thanks Dai. I'm glad you like the panzergrenadiers. My idea was to have basing that would work in any theatre (urban basing) and in both winter and summer. The display board is getting some patches of snow added to it for the Battle of the Bulge winter feel without having to add snow to the bases themselves. Thanks Paul! I wish I had a bit more patience so I could work on infantry units without interruption. They take me so long I tend to work on lots of quicker projects along the way. "I am extremely pleased to have this platoon finished and behind me." I love this feeling - the 'resin-based 25pdr' syndrome, in my case. These look amazing (of course) - and I'm particularly impressed by the dedication to the detailing: well played! Yeah, it can be a real slog sometimes getting through certain platoons. Any infantry platoons seem to do this. Guns and infantry teams. I don't mind doing a few stands but a whole platoon takes me a long time. I don't know if I would ever get through an American Rifle Platoon company! Glad you like the details. I tried to spend extra time adding the extra layer of details. Nice job on the platoon Cameron. You might want to dry brush more heavily your bases with sky grey, then maybe white of off-white. The reason is double fold: (a) your figures won't "sink" into the base and will pop out more, (b) ruins are a lot lighter in general, plaster tends to be very brittle and covers everything in white dust. Yeah, the contrast is not quite as high as I was hoping for. 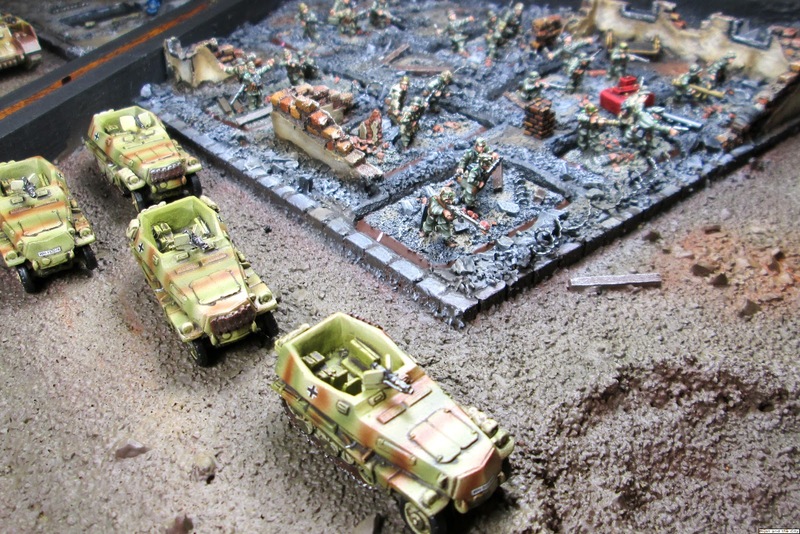 With my next PzGren platoons I am planning to do a different style of base that will contrast more. My nebs have a similar design that you'll see in a few days/weeks that makes the figures pop out a bit more. I didn't want to drybrush to such a light colour that the bases overwhelmed the figures on them either. The basing looks very sharp (as does everything, really). The pink is well chosen as it seems to pop without dominating anything. I may have to steal that trick sometime. Thanks Dave. Originally I had wider patches of pink but they stood out too much in games (looked bad). I put them on the side of the base so my opponent can see them too. I picked pink as it is the panzer division waffenfarbe colour. 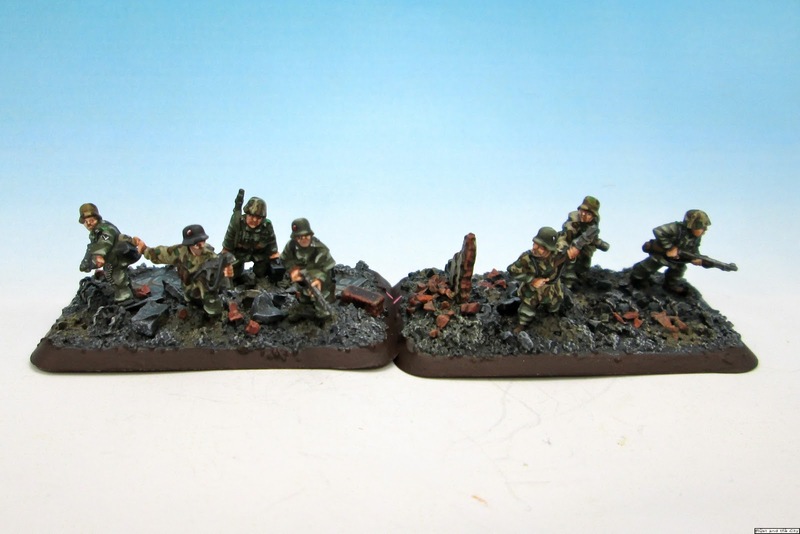 My next platoon with get panzergrenadier green and my nebelwerfers will get artillery red. I'm not sure what to put on my third panzergrenadier platoon yet. Thanks! The have your profile picture on their helmets (minus the black word). Thanks. Glad you like them! Excellent work, love the details on the painting and basing, really impressive! Lovely models and basing. I'm assuming (from what you say in the article) that you'd prefer to paint infantry off-base rather then already attached to one? Would this speed up or hinder your painting? Hey, I sent you an email reply. I usually paint FoW infantry on the base now as I find it faster and sturdier.